Be the amazing Mama or Grandmama who pulls out this gingerbread scented play dough for the kids to “make” their own cookies with! Have jars packaged up for them to take home for more fun later because this makes a great gift! Grandmothers have a special kind of magic. They just seem to think of everything and it’s the little touches done out of love that mean the most and have the longest lasting memories. I truly believe that making this gingerbread scented play-dough will be one of those memories for you. Most of the fun for kids in making cookies is rolling out the dough and cutting out the shapes. Katy and I both sat down at the table this week and had fun playing with our Gingerbread Play Dough and I just imagine what a cool grandmother I’ll be when my grandkids come over for Christmas and I have their own cookie kit just waiting on them that they can make again and again. Mamas and Grandmamas think of everything. This also makes excellent gifts for kids, grandkids, and school friends. One recipe will make about two 8oz jars. I package it up in 8 ounce mason jars and tie a cookie cutter to it with a ribbon. Of course you can still make real cookies with them also, but the fun can also continue long after the cookies are baked and even when they go home. This inexpensive recipe takes just minutes to make. Don’t ya just love it when being the fun mother or grandmother who “thinks of everything” only takes a few minutes? 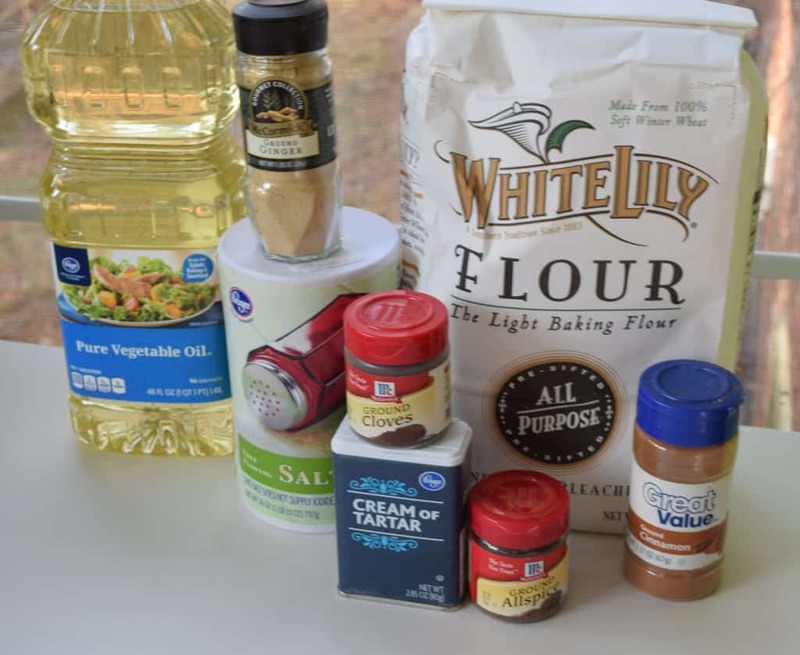 You’ll need: Vegetable oil (just a smidge), Salt (iodized or non iodized, just grab some salt), All Purpose Flour, Cream of Tartar, Ginger, Cloves, Allspice, and Cinnamon. Now, if you don’t have the Cream of Tartar you’re gonna need to go buy that because it is pretty important in this recipe. If you’re anything like me, you have it but have to dust it off before using. Yup. It’s one of those :). If you don’t have all of the spices, though, you can just improvise. 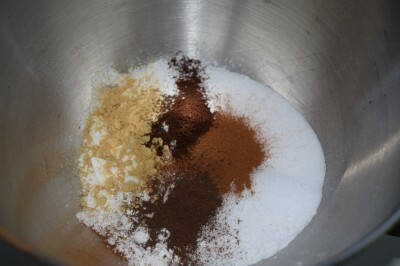 Add nutmeg in place of cinnamon, leave out the allspice and double the cinnamon, etc. Toss in a little pumpkin pie spice if you like. Just play around with it. I’m giving you my exact measurements to make life easier for those of us who tend to kinda go by the book on things. Okay, I generally do about big things like laws and such (I currently do at least, although the no chicken ordinances in my town will eventually turn me into a criminal. Just wait for it – and set aside a jar of change to go towards my bail fund if you’ve a mind to).When it comes to the rest of my life, I figure there are real things to stress about in this world and seasoning play-dough is not one of them. 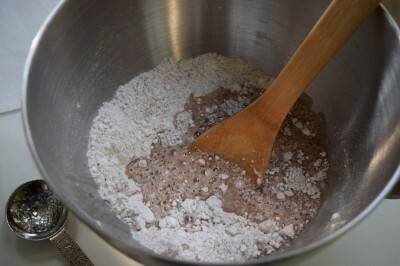 Place flour, salt, cream of tartar, and spices in a sauce pot. Stir that up kindly good. My Grandmama used to say “kindly” in place of “kinda”. In these pictures you see me mixing this up in a mixing bowl. Y’all, that is stupid. I just dirtied up a bowl for no apparent reason. I am just so used to grabbing that bowl when I mix up things for photos that I did it out of habit. My instructions to you are to mix it up in the pot you are going to cook it in, otherwise there will be thousands of needless dirty bowls around the world resulting from this post. Possibly millions. 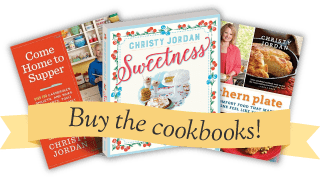 did you know that 300,000 people come to SouthernPlate.com each day? I sure could dirty up a lot of kitchens if I’m not careful. Add your water and oil. Stir it up as best you can. You’re going to think this is so watery that there isn’t any way it could ever turn into anything that wouldn’t slip right through your fingers. Put this over medium heat and stir constantly as it begins to warm. You’ll notice big old glops form and start to stick to your spoon. At this time, use a heavier hand and start scraping the bottom and sides as you stir until it all comes together in one big old ball. Seriously, it will happen. I promise. Be patient. Mine comes together in a little over 5 minutes. Yours may take ten or even 15 and that is alright. Time is relative to the amount of heat you are using, the thickness of your pot, etc. You’re good so don’t be all “mine isn’t working like Christys is, I must have done something wrong.” You just gotta tell yourself, I got this. I look at most things in life like I look at getting lost. When I was a teenager, I realized what a horrendous sense of direction I had and I decided one day that if I didnt end up where I wanted to go, I was just going to change where I wanted to be. I’m not saying you won’t end up with play dough here, I’m just saying you shouldn’t fret so much when little things seem to not go exactly as planned because it all turns out fine in the end. A lot of people think cooking is an exact science. Well, it is if you expect exact, uniform results every single time. But some of the best meals ever created were the result of discoveries of new and wonderful things made through mistakes. For some, cooking is a science. For most, it is a discovery. Sometimes I have no idea what I’m going to cook as I head into the kitchen. During the process, I may pull four or five things from the freezer, combine it with a few things from the pantry, and season it based on my mood. My only dilemma when I’m done is to figure out what to call it. Some of my most loved meals have come about this way. Every now and then someone will mess up a recipe in a small way and comment something like “it was too salty, so I had to throw it out.” and I can’t help but gasp in horror. I would never throw it out. Drink a big glass of water, add more sauce to the dish, modify it and eat it and learn what not to do next time, but throw it out? Oh goodness. Life is no different. You don’t know what the day holds for you, none of us do. But go out there with an open mind and a heart for joy and you’d be amazed at the riches you’ll bring home. Don’t discount a day just because it isn’t perfect. So that whole rabbit trail didn’t really have anything to do with Play Dough but some folks needed to hear it and I was writing a Play Dough post, so there. Look at that big old glop! See? I told ya! Put it in a bowl and let it cool a few minutes before covering it up and letting it cool completely. After it’s cooled completely, I stick it in a gallon sized zipper seal bag and give it to Katy to knead. It just needs a few minutes of kneading the very first time until it is all ready to go. Store it in an airtight container such as a bag or mason jar to keep it fresh. In medium saucepot, combine all dry ingredients. Stir to mix. Add water and oil. Stir well. Will be very watery. Place pot over medium heat and stir constantly with a sturdy spoon. After a few minutes, glops will begin to form. 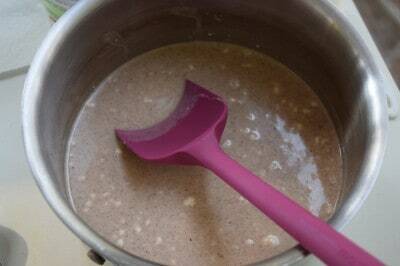 Keep stirring until the entire mixture comes together into a big ball, 5-10 minutes. Remove dough from pot and place in bowl. Allow to cool slightly and then cover and allow to cool completely. Once completely cooled, knead until fully blended. 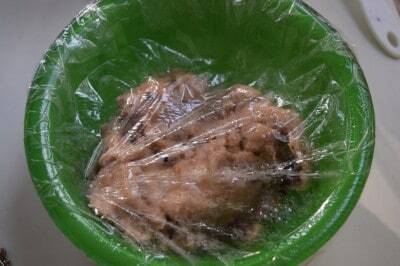 Dough is now ready to be stored in an airtight container and played with. You don’t know what the day holds for you, none of us do. But go out there with an open mind and a heart for joy and you’d be amazed at the riches you’ll bring home. I can smell it already. Is this eatable if the children eat it? I’m sure it is! All of the ingredients are safe… If it smells good – I might eat it too! Cute! I was wondering too if this is edible? This looks amazing! Definitely going to try to make a batch for the grandkids this weekend. And thank you for the side trip down the rabbit trail – wonderful words of advice! After rolling and cutting out the shapes does it dry hard so one may use them for ornaments to hang on the tree? I haven’t tried that but it is the exact same texture as play doh, which gets crumbly when dry. So I’d think this would be crumbly as well. For what you’re wanting, I believe I’d make a salt dough ornament and add the same spices, and then bake it. I made cinnamon ornaments with my students when I was teaching. They dry and hold up well, not crumbly at all. 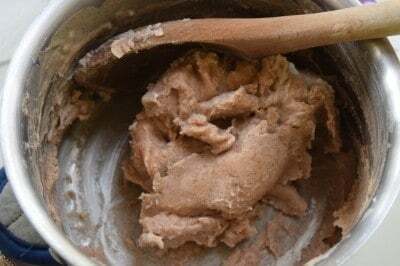 Mix together to form a “dough”. 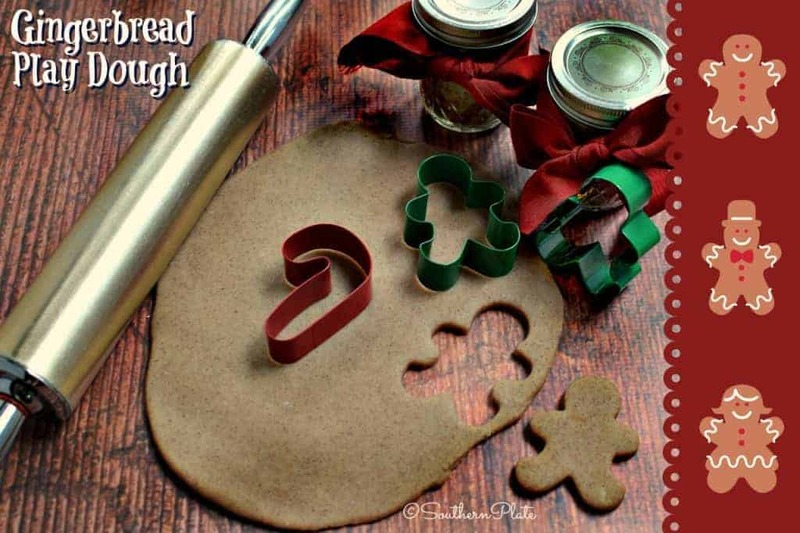 Roll out and use cookie cutters to make ornaments (make a hole at the top for a string). Let dry (depending on the temperature and amount of humidity it might take longer than overnight). The dough smells wonderful (but inedible because of the glue LOL). Good grief Christy! Is there anything you can’t do??? Could you run for president? We could use someone who can do anything and has good common sense ( and uses it ) running this country! Thanks for this recipe. Oh my!! Thank you Christy!! My grand kids will love this!! I know what we all will be doing this weekend here!! I love your recipes as well. We may try our hands at one of those as well. I am so glad I found you!! Thank you!! Christy, is it okay to use self-rising flour? I was wanting to make some for my grandkids to play with tomorrow and all I have is self-rising. In this case, I think it would be just fine. I haven’t tried it personally, but I can’t see any reason why it wouldn’t work. 🙂 HAVE FUN!!!! FYI I tasted it….yuck!! But mine looks amazing, Thank you! What a fun, inexpensive play-thing to make for any of the kids in your life!! Cracked up a Phyllis’s comment and your reply!! Glad I didn’t have a mouthful of water or I would have baptized my laptop!! Thank you for another winning recipe that I’ll be sharing on Facebook! This play dough is THE BEST THING EVER. I use this recipe all the time. It makes a huge batch, perfect for sharing. It lasts and lasts until the kids leave it out one time too many. We like it with the spices, we like it without. I’m making up a couple bathes today to give as birthday gifts to some nephews, both of whom have too many toys (that’s not hard, haha!). I want them to have some birthday fun, but not add MORE stuff to their collections of “boy stuff”. A container of this playdough, some homemade slime, a roll of tape, notebook, glue-stick, and crayons, and I’ve got less than $10 invested into TWO 5-year-old birthday-boys, AND leftovers for some of the other cousins watching wistfully from the sidelines! Happy me, happy everyone!!! Thanks a ton for this recipe! What a great present!!! Best Aunt ever award! !